Slowly I'm making progress on the great backlog of projects on my work table. The most recent piece to reach completion is an enameled pendant titled Aloft. The base of the pendant is three different layers of smooth and textured metal clay, stacked to form a reservoir for the enamel. 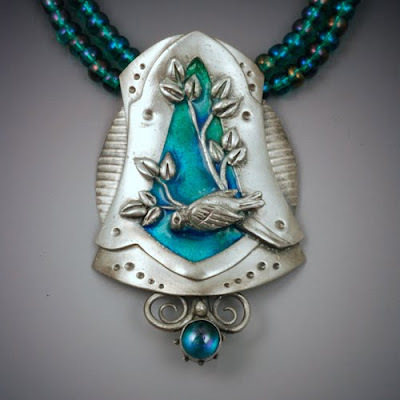 The bird and branches were hand-sculpted and added across the enamel opening. Finally the scrollwork and bezel were attached at the bottom. After the enamel was finished, I set the rainbow topaz. I'm learning a lot about blending colors of enamel (I still need to get my color samples made, but I was too impatient to wait!) and the behavior of the enamel in the kiln. After several rounds of kiln enameling now, I'm thinking I really prefer torch enameling because of the control it offers. Of course, my Little Torch probably doesn't have enough power to attack a piece this large (2" x 1 5/8"). Next on the work table: two layers of silver (one sculpted similarly to this) awaiting a sandwich with enameled copper.